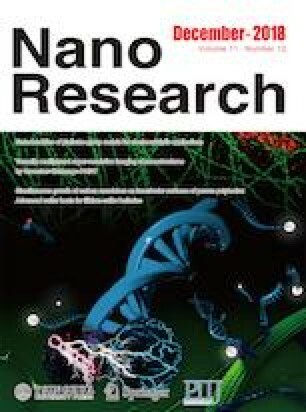 As an attempt to minimize the usage amounts of noble metals in catalysis, PtAg alloy nanocrystals with a porous nanosheet morphology were fabricated through a galvanic replacement reaction. During the reaction, ascorbic acid was added to the solution to protect the Ag triangular nanoplates from being totally etched. Structural characterizations indicated that the obtained nanocrystals had thin porous basal planes and winding edges with abundant bulges. Such unique two-dimensional porous architectures endowed this nanomaterial with plenty of catalytically active sites and structural benefits in electron and mass moving, as well as morphology stability. 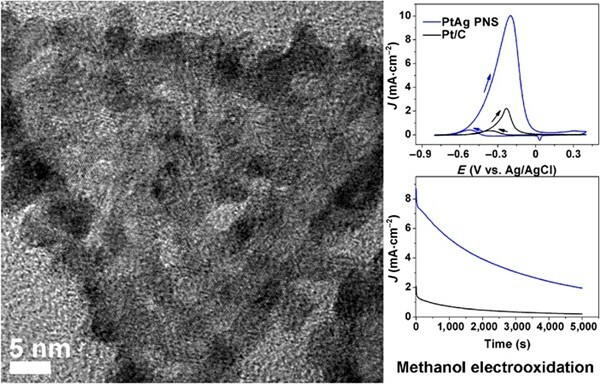 Electrochemical tests proved that the PtAg porous nanosheets had superior catalytic activity and durability towards methanol electrooxidation in basic media. Specifically, the mass and specific activities of the PtAg porous nanosheets were 4.5 and 2.7 times higher than those of a commercial Pt/C catalyst. In addition to the special structures, the introduction of Ag enhanced the catalytic performances of the PtAg porous nanosheets. Supplementary material (further TEM images of PtAg porous nanosheets and the sample obtained in the absence of AA) is available in the online version of this article at https://doi.org/10.1007/s12274-018-2160-3. We are grateful for the financial support of MOST China (No. 2016YFA0203200) and the National Natural Science Foundation of China (Nos. 91430217 and 21427811).